A corner of the Internet typically reserved for mothers nearly broke last week when an article calling out the quietly pervasive condition known as 'stay-at-home-mom depression' exploded on social media. Talking about the mental health challenges that come along with raising children as a full-time job is long overdue—and it's the rallying cry many moms need. Last week an article on today.com elicited a collective “THIS” from women across the Web thanks to its frank take on an underdiscussed but very real mental health challenge: stay-at-home-mom depression. The essay—written by Megan Powell, the 32-year-old mother of five behind the blog Momma’s Tired—nailed the day-to-day reality for many SAHMs: balancing the vast task of raising children and running a household while simultaneously fending off comments about how it must be so nice and relaxing to not have to go to work. As a stay-at-home mom for 10 years and counting, I too felt a surge of vindication reading Powell’s essay. Not going to a traditional job every day in favor of full-time parenting is no walk in the park (as any mother or father who's ever stayed home with the kids even for a day can imagine). Anyone willing to stand up and say that deserves a standing ovation from the one in five U.S. parents who stay home full-time (and, let's be honest, from the everyone else too). But for some women, there exists a deeper sense of distress that can plague those whose daily routines revolve solely around the kids. “It’s like cabin fever after a few days, except it’s your life every day,” says Danielle Moeslein, a 30-year-old stay-at-home mom in Missouri. Powell's essay put a name to that panicky, helpless feeling that sets in when you start to believe that you exist only to help others exist. Or feel like you might want to be doing something more but can't talk about it because you're "lucky" to have the option of not working. Or when every small thing in your life feels like a struggle—from brushing your teeth (see: toddler climbing up your leg), to trying to cook a meal for yourself (oh wait, the baby is hungry right now and feeding her is more important), to even getting dressed (why bother?). 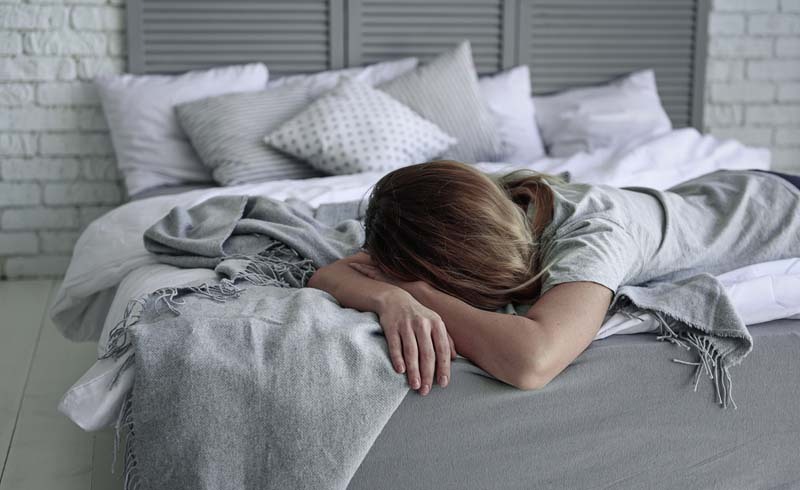 Just like postpartum depression may be triggered by external factors—a major life change, a shift in hormones—stay-at-home-mom depression is often the result of big, often stressful changes in your life. “Stress exacerbates any condition, mental health or otherwise,” says Melinda Paige, Ph.D., a professor of clinical mental health counseling at Argosy University in Atlanta. And stay-at-home-mom life is rife with triggers. Isolation, loss of purpose or identity, and lack of social interaction can all play a role in the development of depression. In other words, being home alone with demanding young children for what seems like an eternity may not always be the most ideal situation for prime mental health. Despite all the strides we’ve made in talking about mental health, depression is still stigmatized as a personal failure. That pressure feels particularly frustrating for a lot of stay-at-home moms, myself included, who fall into the roles less by choice and more by circumstance. Moeslein, for instance, tells Glamour that she never planned to stay home, but after her son was born with medical complications as a result of a bladder condition, sending him to day care wasn’t an option. She had no idea what she was getting into, but she didn’t have any other choice. During her seven years as a SAHM, the mother of three struggles on and off with the same depression that plagued her in college. “As a mom, especially as a mom who stays at home and suffers from depression, you just don’t have that time to take care of yourself because you’re so busy taking care of your family,” she says. “You do it because you don’t have a choice." Complicating matters is the fact that depression is often overlooked among SAHMs because not going to work every day is viewed as a privileged choice. It's lucky. That often means moms who struggle may feel like they don’t have the right to speak out. “I told myself that so many other women would kill to be home with their kids all day, so I bottled up my feelings for fear of seeming ungrateful,” says Pamela Gillett, 30, a former stay-at-home mom of two from Michigan who went back to part-time in order to cope. Compounding the pressure that many at-home moms put on themselves to not feel ungrateful is the message that if you’re at home and unhappy, you have only yourself to blame. Common advice given to at-home moms—get up early so you can have “me” time or exercise at home—send the message that if you only worked a little harder, you wouldn't be so miserable. At the height of some of my own depressive episodes as a SAHM, I can remember crying while pushing my daughter outside in her little baby swing, telling myself over and over that I should be happy just to be with her, or crying when, yet again, that I had to drag four little kids with me to get my teeth cleaned because finding a reliable sitter is not as easy as all of those “helpful” articles make it out to be. Not being able to voice my own misery or find the help that I knew I needed only served to make me feel like even more of a failure as a mom. The reality is, the very structure of stay-at-home mothering can make a woman prone to depression even more susceptible. “As a person, you need conversation, you need human interaction, you need stimuli that as a SAHM you don’t get on a daily basis,” Moeslein says. “That’s something nobody talked to me about before I had kids.” Modern family dynamics are getting worse at supporting this, Silver says—extended family members like cousins are less likely to live nearby and grandparents are more likely to be working and living their own active lives. Those key forms of social communities once available to SAHMs aren’t always there anymore. The systemic struggles that SAHMs face are also a very real part of the problem—from the way we treat mothers postpartum (spend 15 minutes with a doctor checking in on your health after giving birth and hope that covers it! ), to the lack of paid maternity leave. The message to moms is clear: You’re on your own, lady. Over a quarter of all mothers in the U.S. don't work outside the home, according to recent survey data—why has it taken so long to acknowledge the mental health challenges we're faced with? Putting a name to the phenomenon of stay-at-home-mom depression helps legitimize it. It’s a rallying cry for any mom who has ever felt this way. For 10 years I have believed that I am just not “good” at being a SAHM. I’ve told myself, over and over, that while staying home may not be the best thing for me, it’s the best thing for our family right now—so I’d better learn to deal with it. I’ve convinced myself that all the other at-home moms out there are waking up excited about yet another day at home with kids, while I sometimes wake up wanting to cry. I’m certainly not alone in this. “I always thought I was just having a bad day,” says Kara Collins, 31, a mom of four boys in Maryland. She’s tried medications and communicating more openly with her husband about her struggles but still feels like she’s living in “survival mode.” The term “stay-at-home-mom depression” was new to her, but putting a name to the feelings she’s struggling with has helped her feel like she can start to move forward and face them. “I need to find my identity outside of motherhood,” Collins says. “I’m hoping to start a school program, which I think will help me dig myself out of this darkness." Like Collins, most moms—working or not—are generally aware of what they should do to get the help they need, like talk to their doctor, socialize with other adults, and find interests that fulfill them. But whether they have the energy or ability to actually do those things is another story. “Women often don’t feel they deserve [help], or they think something is wrong with them and that they’ve failed in some way if they have to go to somebody else for help,” Silver says. But by being more open about how it is possible to struggle with stay-at-home depression and love your kids more than life itself, hopefully, women and health care providers will be able to bridge the gap to help stay-at-home mothers feel more acknowledged and cared for in the future. Simply hearing the term “stay-at-home-mom depression” has helped me validate how I've felt over the past decade. It’s not me that’s the problem. Or my kids. Or even my partner not understanding. The truth is, there is a very real lack of knowledge about the realities of women staying home—especially those women who may already be prone to depression. For those of us in the trenches, we can help by being more honest about our own experiences, modeling truths for future generations of mothers, and being kind to ourselves as we figure out how make staying at home work better for everyone.